The majestic mountains, the beautiful lakes and the nearby towns of Chamonix and Passy sets the backdrop for numerous outdoor pursuits in the summer. Whether you intend to spend your time for quiet reflection or pure adrenaline-rush, you will find something to your taste and ability. Get a birds eye view of the valley by taking a tandem parapent flight. A “must do” in Chamonix ! You will fly in tandem with a qualified parapent pilot and witness some of the most spectacular scenery in the Alps. You can fly from various locations, depending on the weather and winds. It will take an hour from when you meet your instructor to when you land, on the Brevent flight. All instructors are French Government qualified, speak English / French and have a minimum of seven years flying experience in the Chamonix valley. Taking off as night releases its grip on the day, you will drift silently up and over some of the most spectacular alpine scenery on the planet. Follow in the steps of Jules Vern as the wind carries you effortlessly away over the mountains of France, Italy and Switzerland. The activity does run all year round (weather conditions dependent) and starts in Praz sur Arly down the Chamonix Valley. The meeting point is early in the morning (between 7.30am – 9.30am depending on the season) from Praz sur Arly (near Megève) and the flight time is around 1.5hours from 280euros per person. The adventure lasts about half a day (about 4hrs) and includes the preparation + inflating of the balloon and Champagne on landing! There truly is no better way to see the glacier up close, marvel at the mountains, reach 3000m, admire the Drus and return to the valley floor – all within half an hour. Hover above the peaks, scale the glaciers, soar above the valley. Helicopters seat up to 6 people and there are various routes you can take. Price: Drus 10 mins 80 € per person, Grandes Jorasses 15 mins 105 € per person , Mont Blanc 20 mins 160 € per person, Mont Blanc + 30 mins 215 € per person. For the ultimate adrenaline thrill, launch yourself from a helicopter 5000m above the Chamonix Valley – that’s higher than the summit of Mont Blanc. Your adventure will start with a 15 minute flight around the majestic peaks of Les Drus, the Aiguille du Midi and over the Mer de Glace. When the conditions are just right you’ll be given the signal to jump and then, strapped to a skydive pilot, you’ll feel the wind rushing past your ears as you launch yourself into the sky. Experience 3500m of freefall as you plummet past some of the highest peaks in Europe before deploying your parachute to drift back down over the glaciers to terra firm. Horse rides for novice or confident riders (one hour or two hours). Trekking on horseback (half-day, full day or several days). Don a wet suit and harness to abseil down waterfalls, slide over water-smoothed rocks, scramble over boulders, jump into pools of white water as you work your way down the canyon with our Evolution 2 qualified guides. You can be as full on as you like, or you can choose to take an easier route whilst your group jumps. Price: Guide from EUR 200 for half a day. This river is more gentle for younger children. The rafting guides know just how to make sure everyone has the right level of fun. Prices: From EUR 30 per person. Also Commencing from Passy, Guided by an expert rafting instructor, experience the excitement of the 2 man ‘Canoe-rafts’, or single person ‘Airboat’ where you are in control. From your easy to learn, maneuverable raft, you will enjoy the views of the Mont Blanc chain, rapids and whirl pools on the Arve (Class II) river. 1hr15min of navigation with or without a partner. Surfing is not something you’d typically think of in relation to Chamonix but riding the glacial waters on a big float comes pretty close. Wearing flippers to help you steer a swathe through the water, you’ll shoot through the white water, whizz round the whirlpools and ride the rapids like a pro surfer. Get ready to channel your inner James Bond on this life affirming adventure. 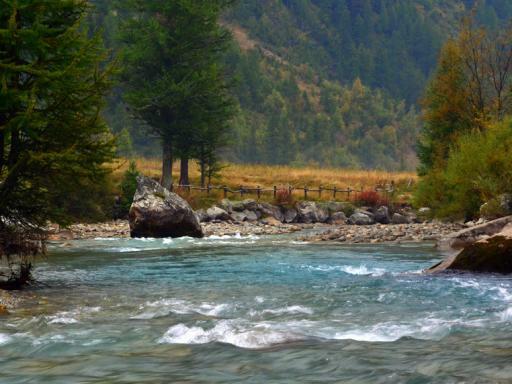 You are led by a professional guide to swim/surf the alpine rivers and rapids for the best white water experience. Price: From EUR 45 per person. Walk across iron bridges strung between rock faces and scramble up ladders high in the mountain peaks for jaw dropping views – if not jaw dropping thrills. Originally used by the Italian Army to transport ammunition in the First and Second World Wars, Via Ferrata – iron walkways, now enable us to experience the thrill of climbing without the need for technical know-how. You’ll be taken up to the sheer rock faces of Passy, about a 20 minute drive from Chamonix, where you’ll scramble along adrenaline pumping routes overlooking dramatic views of Mont Blanc. Your adventure will take approximately 5 hours and the price includes safety equipment, a climbing guide and return transport from Chamonix to Passy. Whichever you choose, our guides will make sure it’s a summer experience you never forget – especially all those jelly leg moments! Channel your inner Arctic explorer and explore one of the most phenomenal sights on earth – the ridges and crevasses of a glacier. Mer de Glace – a fantastic introduction to glacial hiking. Armed with crampons, harnesses and ice picks, our qualified guides will help you traverse this spectacular sea of ice. Marvel at the unbelievable crystalline blues and peer into deep crevasses. Whether you’ve never set foot on ice before, or crampons are as familiar to you as a pair of slippers, this is an experience not to be missed. Summer in the mountains offers the perfect playground for rock adventures no matter what your level. We offer Discovery trips for beginners and Action trips for more experienced rock monkeys who are interested in tackling some technical climbs. From overhangs and steep graded ascents, to crack lines, it’s impossible to run out of thrilling routes to pit yourself against in this climbing mecca. The focus of mind and body on achieving an ascent, combined with the simple pleasure of feeing sun-warmed rock under your fingers, makes for a unique experience. Don’t miss your opportunity to try it. And if you’re lucky enough to be here in July, you might even pick up tips from some of the world’s best climbers who compete to be the fastest or most proficient technical climber at the Chamonix Climbing Festival. High mountain routes on rock and ice are available – Petit Vert & Cosmique, plus many more. Introductory Mountaineering course: The high mountain and glaciers offer little technical routes that all people in good physical condition can practice. With this course, we will introduce you to the mountaineering world and you will witness landscapes of great beauty while discovering climbing, with rock, snow and ice technicalities. Objective Mont Blanc: Mont Blanc is the highest mountain in Western Europe and one of the most famous, reaching an altitude of 4810m. The goal of this 5 day training course is to reach the summit of Mont Blanc, with 3 days of preparation combining technicalities and acclimatizing in order to obtain the maximum performance for achieving the summit. Advised and encouraged by our high mountain guides, you will find the energy to reach the coveted summit. Discover some of the best bike trails in the Valley on this cross country experience. Cycle through forests and by rivers, getting into the heart of nature. Downhill biking takes you on the ski runs, the mountain looks so different in the summer. Head down different levels of runs on your downhill bike and have the ride of your life! Lac de Passy: The nearest to Chamonix and the biggest lake. Bring your beer, water wings, windsurfing board and barbecue and just hangout. 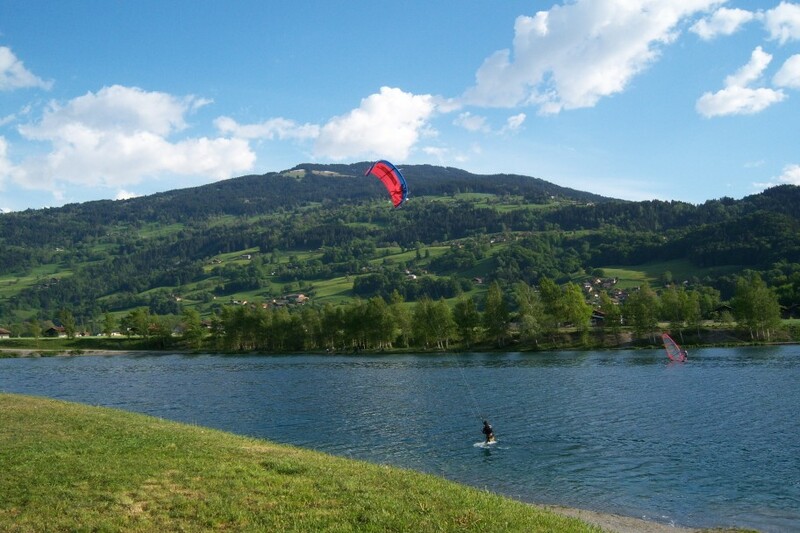 Lac Annecy: Lake activities include swimming, windsurfing and kayaking. The water is crystal clear and not too cold. The surrounding scenery provides a marvelous backdrop. The lake shore and surrounding countryside is great for roller-blading, mountain biking and walking. 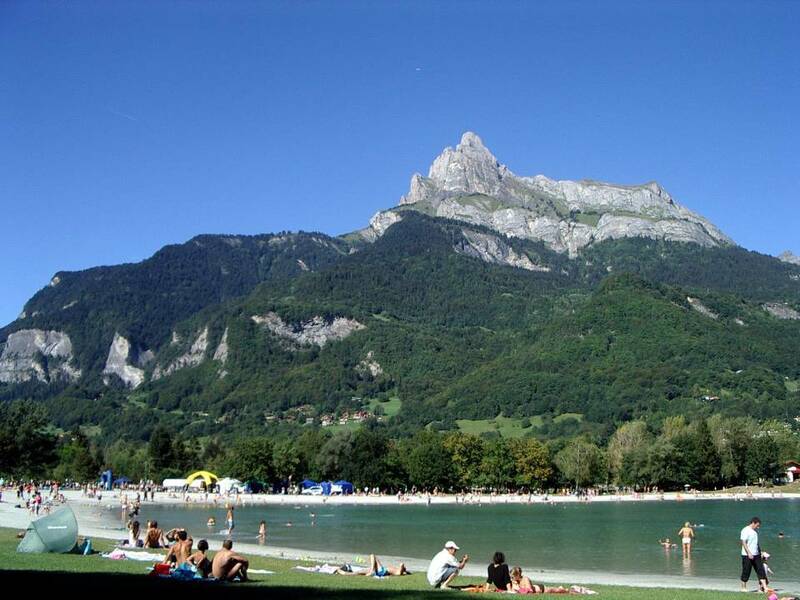 Lac des Ilettes: Three beautiful lakes offering all three activities and home to the “Transat” for good beach food. Les Ilettes is also the scene of several free lakeside concerts each summer, not to be missed. You are at the foot of Les Drus, 3754m, L’Aiguille Verte, 4122m, L’Aiguille du Midi, 3842m and Mont Blanc, 4810m. Imagine yourself treading the fairway of the 17th hole with the north face of the Mont Blanc and its cascade of seracs formed by the Bosson glacier as backdrop. We can arrange your permit to fish in the lakes or in the rivers. Day or fortnightly permit are available at the Gaillands chalet, at the Saint Antoine Tobacconists in Les Houches, or at the tourist office in Servoz or Vallorcine. 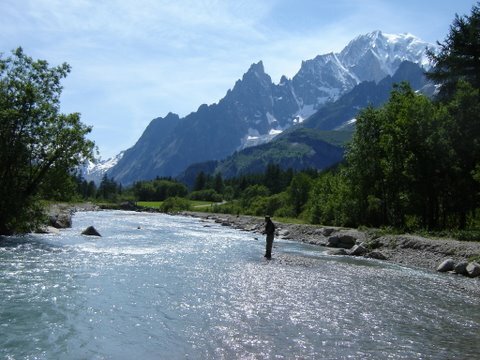 The guide to fishing in the Valley is also available in the Les Houches tourist office.